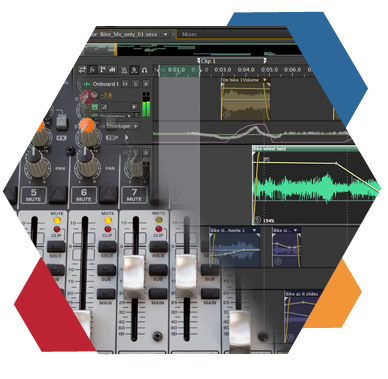 Located in Northern New Jersey, the audio post-production facility provides a simple and low cost solution for the production of many kinds of commercial sound tracks. This is not a music recording studio, so no bands. Rather this post-production room is well equipped to handle full production for the internet, multi-media, audio books, museums exhibits and other themed attractions, training materials, sound cue tapes for theatrical and other live productions, and radio commercials. I had years of experience editing hours of narrations and interviews. (Most of this experience was with razor blade splicing of audio tape on an old Ampex 350.) Over the years I created many complicated multi layered soundscapes for audio environments in such application as a haunted house attraction, comedy records with lots of music and layered sound effects, and sound tracks for exhibits and multi-media presentations. 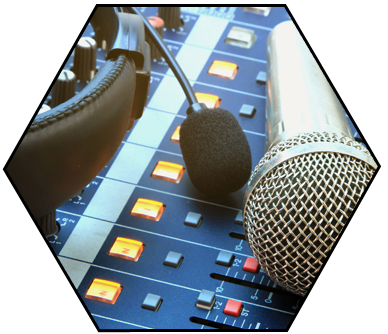 I also produced many radio commercials, audio books, and sound tracks for video productions. Click below for samples. This small post-production audio studio is well equipped to handle a wide variety of commercial sound productions. Using state-of-the-art digital recording, editing, filtering, effects, and mixing I specialize in building sound tracks for almost any application. See the bulleted items to follow. I have several production music and sound effects libraries and can access a far greater selection of tracks from various on-line libraries, ready to use while in the editing session. 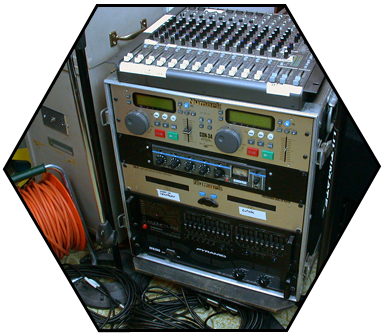 By maintaining several traditional analog tape recorders with all standard track configurations and speeds, I am able to play back existing tape recordings as source material for new digital audio productions. For recording character voice, narrators, music recording, and other open mic sessions, I have access to larger studios if you project involves recording live talent. Do you have old audio tapes and DAT tapes that need to be saved or archived in digital form? 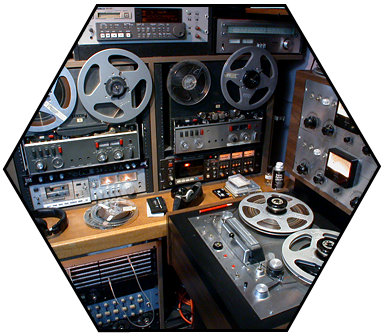 I can transfer from a wide variety of old open reel tape widths, speeds, and track configurations. Also cassettes. These can be transferred to almost any popular digital file format and returned to you on CD, DVD, or thumb drive. Old tapes can be "baked" to remove moisture and restore binding thus bringing back the tape's near original quality before transferring. Other restorative measures such as noise filtering, level limiting, and equalization can also be performed during transfer. Please note we strictly adhere to copyright laws. I can provide live sound reinforcement or a sound environment for most any event, stage show, presentation, social event or other public attraction. When you need to play recorded music or any sound environment in a public space or need a PA system for a small to medium size performance, my mobile sound system is the low cost alternative to a larger concert sound system. This system is excellent for doing PA jobs using a few microphones and several audio sources such as CD players and a basic effects package. For example, this system was used to "pipe in" a sound track of mid 60s music and other soundscapes over different zones for several open houses at the still standing New York State Pavilion from the 1964-65 New York World's Fair. 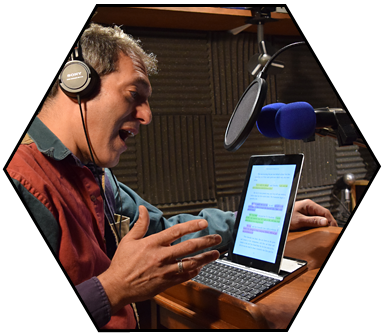 My services in audio production and the talent of many narrators and character actors can bring your book to life. If you're a writer or audio book publisher, you can save time and money by letting me take the job from manuscript to finished audio file ready for your distributor. Click HERE for a sample of some of the books produced by the talent we would cast in your project. This sample is "Backstage Brat" from "Young Arthur & the Magic Sword" by Jon Koons. I provided music and sound effects. I seek to work on system installation as a part of your team or independently. I have wired several audio and television studios including several incarnations of my own as well as for companies like Long Island Newsday, Tenafly Public Schools, and WFDU. The key to any such installation is the reliable interconnection of each system component in a logical and flexible way. 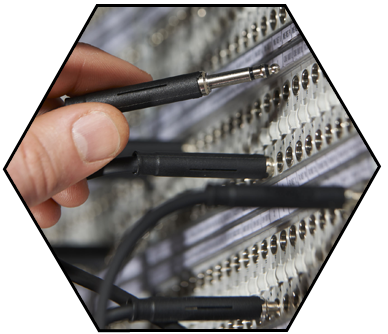 I have taken several installations from a sea of tangled patch cords to a versatile patch bay system allowing the operator to easily reconfigure the system for any given project or temporary need. Excerpts from this multi-image presentation tracing the history of Haley's Comet.